Is Tron 3 Happening with Guardians Director James Gunn? The Tron franchise has been quiet for six years now even though many fans have been hoping that Tron 3 would happen at some point. Disney simply didn't get what they wanted out of 2010's Tron: Legacy and the road to Tron 3 has been a rocky thing, with Disney pulling the plug on the project earlier this year. But a couple of recent social media posts make us think that Tron 3 may actually be happening now. The first bit of potential evidence came from the Tron Facebook page a little over a week ago. Even though there hasn't been any real Tron news for a while, the page posts an update about twice a month just to keep it going. The most recent post had people talking because it featured the outside of Flynn's Arcade with Sam Flynn pulling up to it on his motorcycle. The caption that was used for the picture simply said: "welcome back." This got a lot of fans on the page chatting and buzzing with possibility and excitement, with the top comment saying "Don't even joke about this man. I'm gonna make Tron 3 myself if you keep teasing us." The other piece of evidence came from inside the Disney family, but from a somewhat unlikely source. Last week, Guardians of the Galaxy Vol. 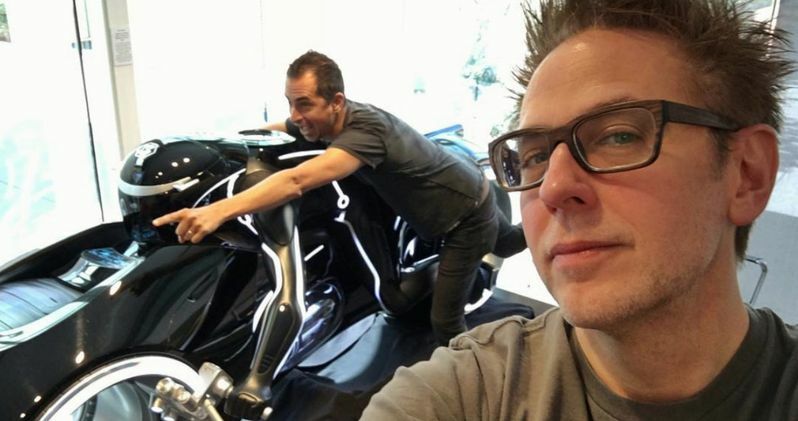 2 director James Gunn posted a picture to his Instagram account that revealed one of the Light Cycle's from the movie had shown up at his conference room, which is located on the Disney lot. "With @jimmyurine & the #Tron cycle (which has mysteriously shown up in our conference room on the #Disney lot)." This evidence is very circumstantial, but the fact that they happened around the same time does seem a bit strange. Disney knows that fan demand for the movie is high, which a petition on Change.org garnering more than 50,000 signatures in support of the studio making Tron 3. It is very possible that the studio has had a change of heart or somebody had a great pitch for the movie and that the ball has started rolling again. Why else would they bring a Light Cycle into James Gunn's conference room? The original Tron is a massive cult classic and Disney had big plans for the franchise, which kicked off with Tron: Legacy. The movie did decent at the box office, bringing in $400 million worldwide, but the massive $170 million production budget made that much less impressive. Plus, Disney is accustomed to franchises that regularly cross or get near the $1 billion mark these days, so it's easy to see why they wouldn't want to move ahead with Tron 3 from a pure business perspective. Disney is all about making money and doing right by their fans, so if there is money to be made and a good story to tell for Tron 3, it is very possible the movie could be happening. Speculatively speaking, James Gunn doesn't have any directorial projects lined up after Guardians of the Galaxy Vol. 2 and he now has a very good relationship with the studio. Is it possible that Disney has tapped him to tackle Tron 3? Maybe not, but it is a potentially exciting thought and he would seem like the right guy for the job. In any case, fans of the franchise now have at least a glimmer of hope that the Tron trilogy will finally be complete.